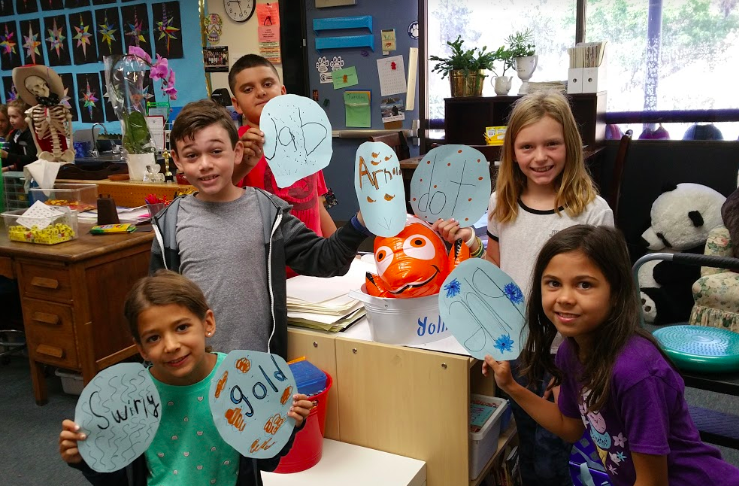 Mrs. Yollis' Classroom Blog: Connect the Dot Stories! 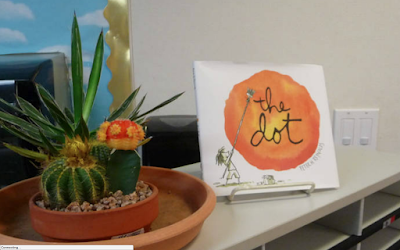 After reading Peter H. Reynold's fabulous book The Dot, we put together a fun "Connect the Dots" writing project with our blogging buddies. We hope to get some fun stories! Here are the steps we took to set up our "Connect the Dots" stories! 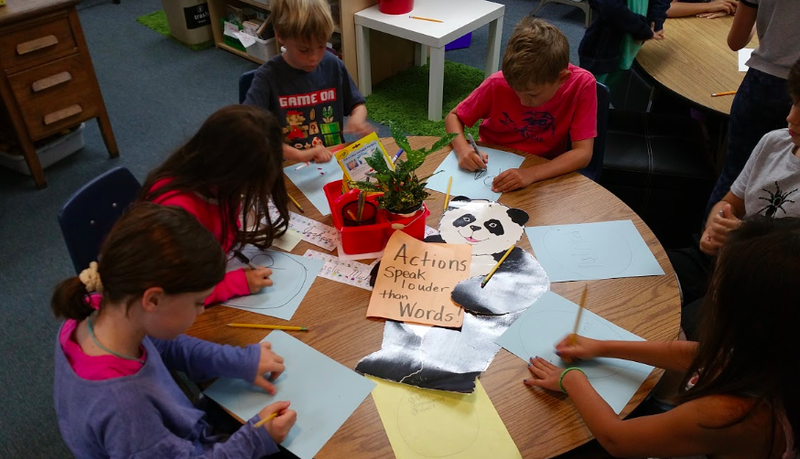 Step 1: Each team made a collection of words from the story or words used in our classroom. The collection could be five to six words. Step 2: Each person on the team wrote one word on a dot and then cut it out. Step 3: Each person on the team decorated their dot. Step 4: This is where YOU come in! Please select a team and write a clever story or poem using all of their words. 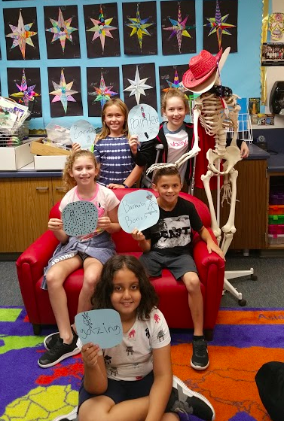 We can wait to read your story in the comments! 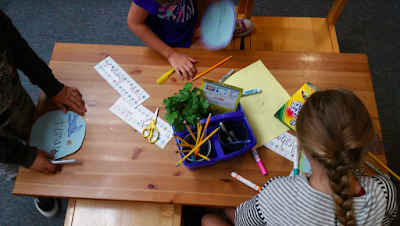 We invite you to connect our word dots into a story or poem! Arnold Fisherson was a fish-detective and everyone knew him. His friend, Linda, was a computer whiz. She knew a lot about them. She always told Arnold where to find the treasures the world had to give. One day, Arnold woke to Linda speaking on his walkie-talkie. “Okay…” Arnold said groggily. He jumped out of bed, and raced to the kitchen. He slept with his detective clothes on, just for good measure. He wolfed down some toast, then headed toward his car. His undercover detective car looked like any old Toyota, but he made some upgrades with it. He zoomed to Buck’s Grocery Store, but he didn’t go too fast that he looked suspicious. Once he arrived, he parked, and walked inside. “There should be a secret entry to the underground lair in the frozen foods aisle,” Linda noted. “Alright,” Arnold said. He looked and looked until he found a frozen pizza box on the floor. Arnold picked it up, and the floor below him opened. Arnold was quickly swallowed in darkness…. Arnold woke to Linda, again, talking. “Well, now I have to find-“ But he didn’t finish his sentence, because something else caught his eye. It was a small, shiny blue thing under a tiny rock. He knelt over, and picked up the rock. There, under the rock, was a small blue key. There was a weird swirly white dot imprinted on it, but Arnold didn’t care. He wanted to find that gold. He grabbed the key, stood up, and turned to the vault. He slid, or tried to slide, the key in the hole. It didn’t work. Arnold tried to jab it in the hole. After two attempts, the key slid in the keyhole. Arnold twisted the key. The vault door unlocked. Arnold pushed it open. In front of him, was a huge mountain of gold. It was so bright and shiny, that Arnold had to look away for a second for his eyes to adjust. Well, Arnold had done it. He dove into the gold pile. “You did it! ?” Linda asked excitedly. Arnold swam in the golden objects. He was really happy. But, he still needed to get this gold to his house somehow. Oh, well. He’ll figure it out. All that matters is that the amazing Arnold has done it again. There you have it! My story! Hope you liked it! Have a good rest of the year! Here is a poem I made for you. I picked your team because I love tacos so much! I also love going to the beach. The last time I was there, I saw several dolphins frolicking in the water. So he took his good friend by the arm. Wilbur wore his swimsuit and took his surfboard. They headed to the beach but first had some lunch. As they both got distracted by dolphins in the sea! My mom and I wrote this story together for you. Enjoy! “Brrr,” said Beverly the Bear, shivering and grinding her sharp teeth. 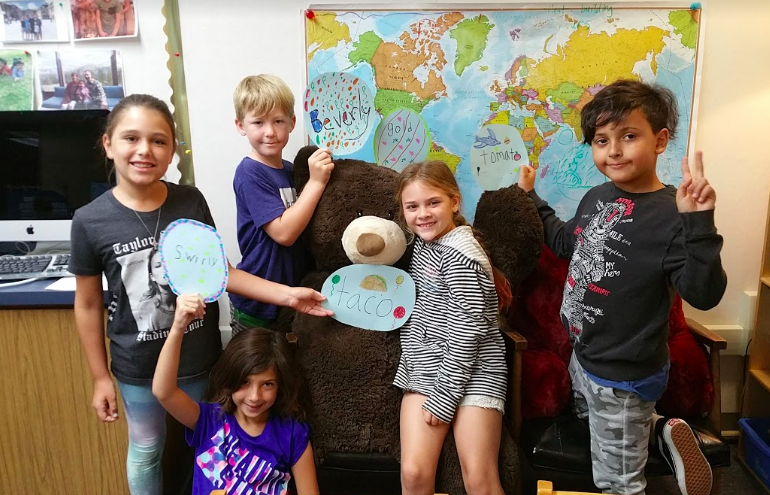 “Why does the International Bear Association hold its annual Taco Eating Competition in the middle of hibernation season?” I was sound asleep deep in my cave and just like every year, I have to dig myself out and schlep to Brown Bear Forest in Sequoia National Park just to retain my title again. “On your paws, get set, go,” bellowed Charlie, and the bears began to prepare their tacos. Beverly grabbed ten tacos shells, filled three with turkey, five with ham, and two with corn beef. She moved to the toppings bar, and added bright red tomato slices on top, her favorite taco addition. She wanted to add ketchup as her second ingredient and made swirly lines on top of each taco shaped like a giant B to represent her name. Her tacos were ready to eat. Beverly grabs her first taco and shoves it into her mouth, starts to chew, and quickly, gasps with pain. “Ouch, what in the world just happened?” cried Beverly. Tears rolling from her eyes and her mouth on fire, Beverly runs to the toppings table and discovers that someone switched the labels on the toppings. Instead of ketchup, Beverly had accidentally put fiery hot sauce on every taco. Beverly knew what she must do. The rules clearly stated that she had to eat only the tacos she prepared. She would have to worry about who switched the labels later. 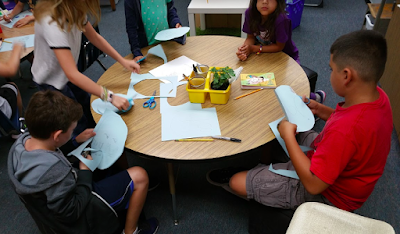 We made haikus for each group. Dot did not like it. @ Lily lucas, we are so proud of you both. Suddenly, the referee Daniel, runs to the stage, yelling “Voldemort cheated. Voldemort cheated.” The audience freezes with amazement and confusion. Daniel is carrying the ketchup and hot sauce bottles in his hand and approaches Voldemort. Earlier that day prior to the competition, Daniel claims he carefully watched the competitors planning their strategies for the competition. He had thought something looked mysterious about the way Voldemort smiled with confidence considering he was the underdog. “During the competition, it all became clear to me,” said Daniel. After seeing Beverly’s face light up bright red, he decided to check out the toppings table. It was then that he discovered foul play. His secret was discovered and Voldemort was immediately disqualified making Beverly the true winner. The winner’s podium was brought onto the stage and Beverly stepped on top. A gold trophy of a taco was presented to her. Accepting it once again, Beverly felt prouder than ever before. The hot tacos challenged her in a new way and she overcame the obstacle to win. After feeling so hot from those tacos, all Beverly could think about now was going home to the freezing weather to resume hibernation. What words from my story helped you visualize what was happening? Do you see and "SHOW, not tell" sentences? 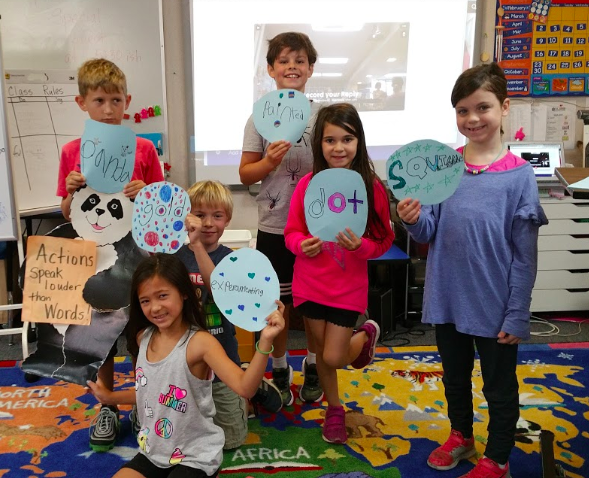 We LOVED your creative story! 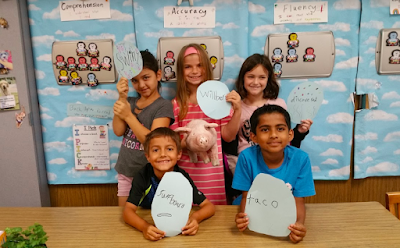 Faith liked that you used the names from our class in your story. “Brrr,” said Beverly the Bear, shivering and grinding her sharp teeth. Scarlet loved the word play! Like, instead of saying on your marks, get set, go! You said, “On your paws, get set, go,” bellowed Charlie, and the bears began to prepare their tacos. We also loved your synonym for SAID. Clearly, said is dead! For example, you used bellowed, yelled, announced, shouted, and cried. Well done! How long did it take you to write this? Thank you everyone for the positive feedback. I'm glad you enjoyed our story. To answer your question, it took us about 30 minutes to write the story. Also, I don't like tacos but my mom does. I had a dream about a pig named Wilbur. He loved to go to the beach and surf. One day, Wilbur went to the beach and he saw a shortboard for sale. It had swirly waves painted on it. It was expensive and he didn't have enough money to buy the surfboard. He also loves tacos so he came up with the idea to sell tacos at the beach and he did. He discovered that lots of people love tacos too. He sold chicken, beef, and fish tacos. He raised enough money to buy the shortboard. The next day he waxed it so he could go surfing on it and he named it Taco. And then, I woke up. I hope to dream about Wilbur the surfing pig again tonight! I enjoyed hearing about your dream. 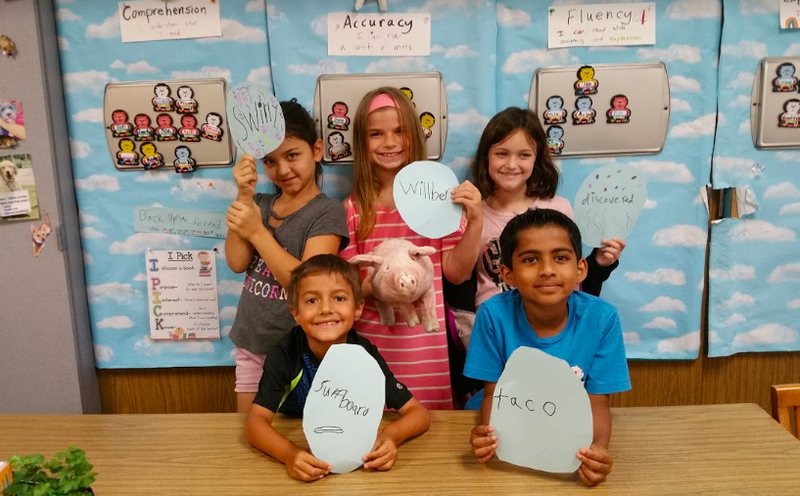 Please keep us posted about Wilbur the pig. Maybe he will play soccer next. Who loved to paint and write poems. He PAINTED a man, who gazed at a can that lay strewn on an old vacant lot. A Pointillist painter, Barnaby was, he CAREFULLY placed a DOT, on the exact spot that the GAZING man sought, to kick that can up the road.